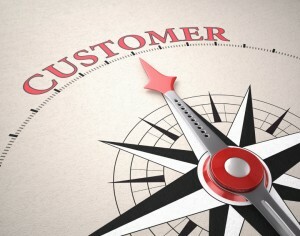 There is a distinction between customer satisfaction and customer retention. Many companies don’t understand the concept. Someone might be happy with your product or service, basic satisfaction, but never purchase again. Why? The gap between satisfaction and repeat business is the relationship between the customer and the sales associate at the company. Creating and building relationships is the link and differentiator. Strong relationships definitely increase the probability that your customer remains yours and not your competitors. Have a few friends or colleagues call your company to ask a question about your services, hours or directions and see how quickly the phone is answered, how friendly the conversation is, and if additional information is provided beyond just responding directly to the inquiry. In general, new customers need to know more about your services and products then repeat patrons. Create a list of items that would help first time accounts learn more about your business. It will be appreciated. Loyalty begins with a person, not necessarily the company itself. People go to the same coffee shop every day because “Mary” knows their name and how to prepare their latte without asking. Make sure you retain your associates who naturally know how to build relationships. Don’t let them go to your competitor for a $1 more an hour. Your customers will follow and you will have lost more than an employee. Empower your staff to make decisions about policies and procedures without having to go to management. Give a dollar amount as a guide. For example, if the item costs less than a $100, and there is an issue, staff should have the flexibility to make the customer happy on the spot rather than having to get back to them. Instruct your staff to be observant. If someone is wearing a sport’s jersey, comment on it. If a woman has on a beautiful scarf or earrings, make a remark. People love compliments. If you own a store, and people are leaving without purchasing anything, try to find out why they came in the first place. Engage your customers. You might learn something new that could help with future sales. Reinforce the concept about first impressions. Make sure your staff and higher management know that there is only one opportunity to make a good first impression. Welcome everyone into your business as you would welcome a guest into your home. It makes people comfortable. Give them your full attention. Put away cell phones. People feel disrespected if the text from your friend is more important than they are. Creating and building relationships takes time, effort, and care. But it’s more than worth it. Relationship is the key. Learn something about your customer that can be shared on their next visit or phone call. It’s those little things that can make a big difference.